Promotion Offers: 5 ISSUES FOR £5 + FREE GIFT! This Valentine’s Day, give a gift that keeps on giving all year round — a subscription to Your Cat Magazine is the purrfect gift for your loved one. Not only will you get 5 issues for just £5 – saving you a massive 75%, you’ll also receive a box of delightfully delicious chocolates from Monty Bojangles. Now, that’s what we call a real treat for your sweet this Valentine’s Day! Chocolate truffles, cute cats, and a massive saving — what more could you want? First 5 issues for £5.00 and then £8.99 via quarterly direct debit with free Monty Bojangles chocolate truffles. 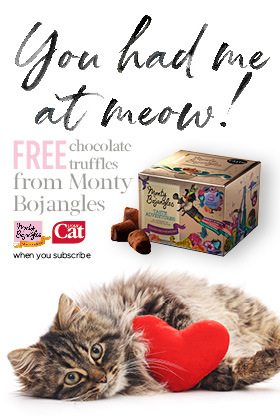 Free Monty Bojangles chocolate truffles : When you subscribe to Britain’s best-selling cat magazine, you’ll receive a FREE box of Monty Bojangles chocolate truffles.